Fabric Fashions & More has been serving the Rush City, Minnesota, area for more than 20 years. 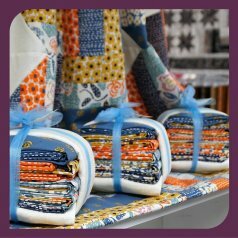 From modern and traditional to scrappy or monochromatic, we're dedicated to offering a diverse selection of fabrics and quilt kits to support all quilting methods and styles. With a friendly, knowledgeable staff of 8 employees, ranging from novice to expert sewing enthusiasts, we are always in tune with our customers' individual skill levels and creative needs. As a small town store specializing in down-home hospitality, we take pride in getting to know each customer by name and making them feel welcome. Our friendly, knowledgeable team members are always eager to help customers with everything from selecting coordinating fabrics and figuring yardage to clarifying pattern instructions. Their goal is to ensure that all who shop at Fabric Fashions & More have an enjoyable and successful sewing experience!